My trusty shooting board, perhaps the great-great-great-grandson of my first shooting board, was getting a little “long in the tooth.” Giving birth to a new one would typically involve about fifteen minutes of labor. But, I decided to prolong the gestation period over a cup of coffee and think about whether the laughably simple “classic” design could be improved. What’s unique about the design Steve came up with? Read his full article HERE! 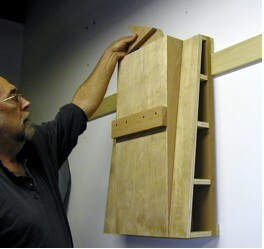 Building the Universal Ambidextrous Shooting Board does not require any special tools — it is mostly cutting and gluing. But in order to achieve the accuracy needed, it is important to mark out and make cuts carefully. For accuracy, I depend on my Starrett Combination Square, an angle gage, and a perfectly flat and true straight edge. All cuts were made on the table saw with a Forrest Woodworker II thin kerf blade. This blade works particularly well on the ¾” plywood used in the project. My “AngleCube” is indispensable for setting tablesaw angles precisely, and really came in handy with the shooting board. I used Titebond III glue for all the joints, not because there was a real need for waterproof glue, but because I like the short “open” time for a project like this. Check out the full archives of The Down To Earth Woodworker monthly column.